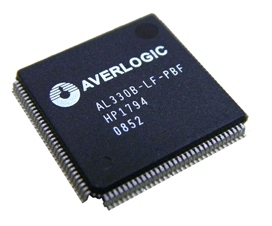 The AL330B is a highly integrated Display SOC, containing a 3-Ch + 10-bit ADC, 2D Video Decoder, Deinterlacer, Scaler, Microcontroller, OSD, and TCON. The AL330B can support small to medium Digital TFT-LCD Panels and small to medium AMOLED Display Devices. The AL330B is a multi-channel analog preprocessing circuit, which includes source selection; anti-aliasing filter; ADC, ACC (Auto-Clamp Control) and AGC (Auto-Gain Control); CGC (Clock Generation Circuit); digital multi-standard decoder containing chrominance and luminance separation from an adaptive 2D comb filter; brightness, contrast, hue and saturation control circuit; programmable horizontal and vertical scaler; image and sharpness enhancement processing; On-Screen-Display; programmable TCON; and a digital RGB signal output etc.